Collection of Miss Blanche Lilliston when she was regent of the Jemima Johnson Chapter of the DAR 1926-1927. David Allen, born 1750 and died 1830 buried in North Middletown Precinct on farm known as James Carroll Bryan farm on Thatcher's mill Pike. There is no marker at grave. A descendant of the Wyhoff family buried in same graveyard. John Allen born 1749 died 1816 is buried in the Paris Cemetery on GrosJean Lot. He was first lawyer to be licensed in Bourbon County. Inscription on monument says "Major Revolutionary Forces and first Judge of District Court of Bourbon County"
Alexander Barnett, surgeon in American Revolution is buried in North Middletown Precinct on Sam Harding farm on North Middletown and Paris Pike four miles from Paris. His headstone is of limestone and the inscription has sluffed off. The lettering on his wife's stone by the side of his is intact. Maj. Walker Baylor b. 1760 d. 1823 in Bourbon Co., and was buried at "Woodlawn" the Baylor home on Peacock Pike about four miles from Paris. 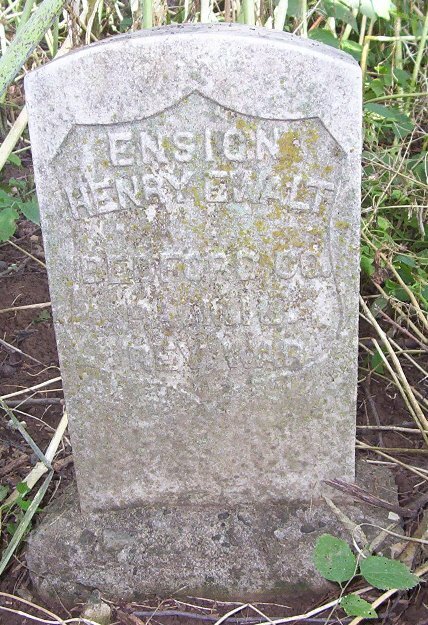 Several years a descendant had his body removed to DAR lot in the Cemetery at Frankfort, Ky.
Henry Banta is buried on Little Rock Precinct on back part of the farm owned by Edsell Clark. 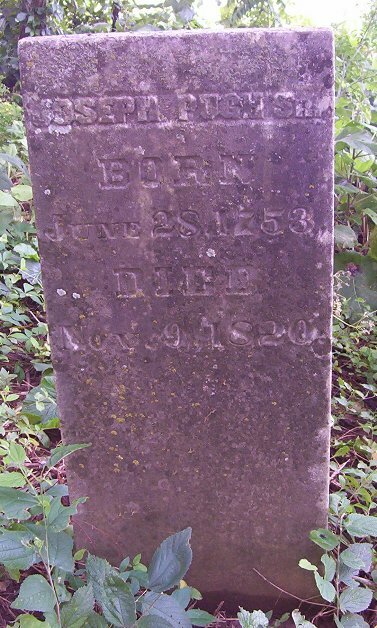 Inscription on his monument recalls "In Memory of Henry Banta who was born January 22, 1762 and Died Oct. 17, 1844"
Samuel Batterton buried on the farm owned by Mrs. Russell Hickman, R. R. 4 in Millersburg Precinct at the intersection of the Cynthiana and Millersburg Pikes with the Redmon Pike. 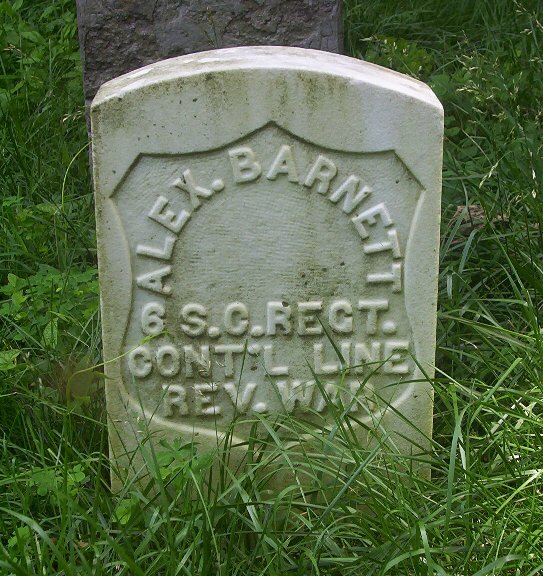 His tombstone inscribed "Samuel Batterton died the 11th day of June 1833 in the 75th year of his age." Archibald Beall is buried in the Cemetery at North Middletown and his grave is marked with white marble shaft, bearing the following inscription: "Archibald Beall born Oct. 3, 1756 died July 3, 1840 a soldier of the Revolutionary War and one of the few survivors of the Battle of Blue Licks"
Edward Boone a brother of Daniel Boone, is buried in Little Rock Precinct about 20 feet from the first bridge beyond the town of Little Rock, Bourbon Co., KY. The on which he is buried now belongs to Troup Clark. He was killed by Indians. Several years ago Jemima Johnson Chapter placed a government marker at his grave. 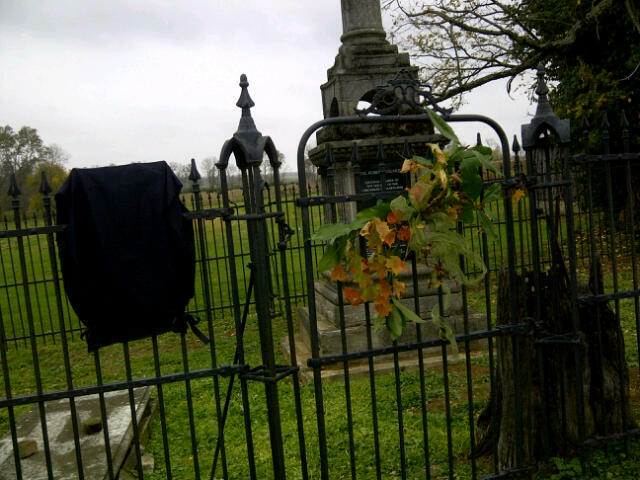 William Bourne Branham is buried on farm now owned by Mrs. James Dodge. Marble Monument records he was born in Va. Dec. 2, 1763 and died Jan. 9, 1845 in Bourbon County Kentucky. The graveyard is surrounded by a rock fence. George Edwards is buried in Centerville Precinct on the farm owned by Mrs. Frank Thompson Grant, just of Brentsville Pike. Grave marked by small white marble monument bearing the following inscription. "George Edwards died Aug. 30, 1835 aged 73 yers 3 months and 24 days." 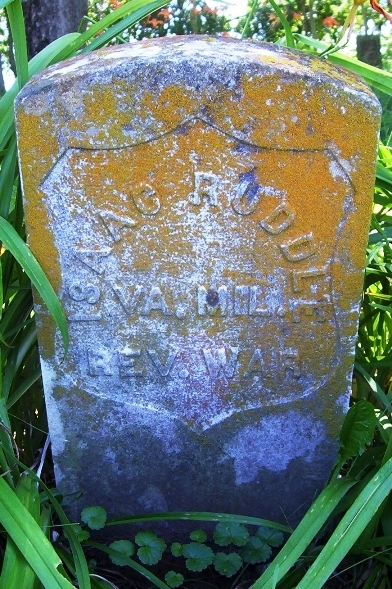 Governor James Garrard is buried in Ruddles Mills Precinct home place, "Mt. Lebanon" on Peacock Pike four miles from Paris, Ky. The place is now owned by his heirs of William Garrard Talbot, a descendant of Gov. Garrard. Thomas Hays is buried on farm known as the Washington Redmon home and now owned by Harve Wagner, on the Redmon Pike in the Millersburg Precinct. The grave is in good condition is in a garden of this home. Jemima Johnson placed a government marker. Joseph Hedges is buried in North Middletown Precinct on farm owned by heirs of Thomas Henry Clay, and situated on Winchester Pike and Paris Pike. A white marble tombstone bears the following inscription "Joseph Hedges born 1780 died 1805"
Thomas Hutchcraft born 1759 died 1825 is buried in the Clintonville Precinct on farm owned by Mrs. Thomas Henry off Clintonville and North Middletown Pike. No marker at the grave. James Jones is buried at Jones Cross Roads where the Ironworks Road crosses the Clintonville Pike on farm own by heirs of Benjamin Stipp and in Clintonville Precinct. A white marble headstone records born March 1758 and died Dec. 12, 1815. 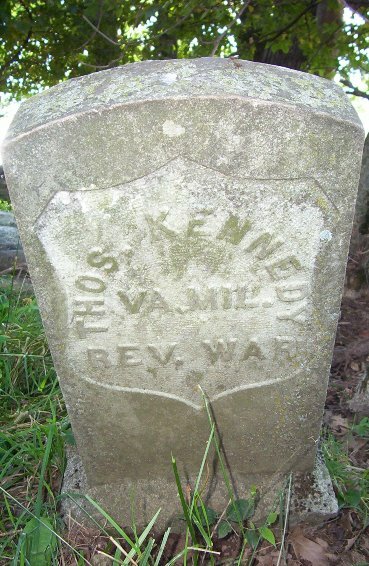 Thomas Kennedy born Jan. 2, 1744 died after 1781 is buried in family burying ground surrounded by stone wall on farm owned by Mrs. Cassius Clay in North Middletown Precinct on Winchester Pike. Several years ago Jemima Johnson Chapter placed government marker at his grave. James Kenney born June 25, 1752 in Va. died March 13, 1850 is buried in family burying ground at his home place on Paris and North Middletown Pike in North Middletown Precinct. The farm is now owned by Senator Henry Caywood. Several years ago Jemima Johnson Chapter placed government marker at his grave. James was born 29 Nov. 1752 Augusta Co., Virginia and died 13 March 1814 in Bourbon Co. Kentucky on his farm where his graveyard is now called Stonerside Farm. Charles Lander born Dec. 29, 1759, died Aug. 14, 1833 is buried in North Middletown Precinct on his home farm now called "Lander's Lane" and is owned by James Carroll Bryan. It is situated on North Middletown and Clintonville Pike, sometimes called Thatcher's Mill Pike. A large slab covers the grave and bears the above dates. Capt. Edmund Martin who was wounded in the battle of Germantown is buried on Federal Highway 68. He was first buried at Maysville, Ky. and bequeathed the plot of graves on which he was buried to the Baptist Church. Later it was decided to build a new church and it was necessary to remove a number of bodies among them Capt. Edmund Martin, donor of the land. Members of the family then removed his body and that of his wife to the old cemetery at Millersburg. When removed to Millersburg a new head stone was erected and the old stone set against the wall. This year the old stone was returned to Maysville and erected in the churchyard after being inscribed as the stone of the donor Edmund Martin. James McClure, died 1783 was buried under the altar of his church, the first church built in Paris, Ky. It stood on High street on lot where George (Cooper) Davis now lives. It was torn down by the Presbyterians when they built a new church on another location and the body of Rev. McClure with the bodies of many, others were removed to the Paris, Cemetery - location of the grave is unknown. James McClure born 1760 died 1813 is buried in Millersburg Precinct on farm owned by Mrs. James McClure and location the intersection of Millersburg and Cynthiana Pike with Redmon Pike. Grave in yard of his home place has no marker. 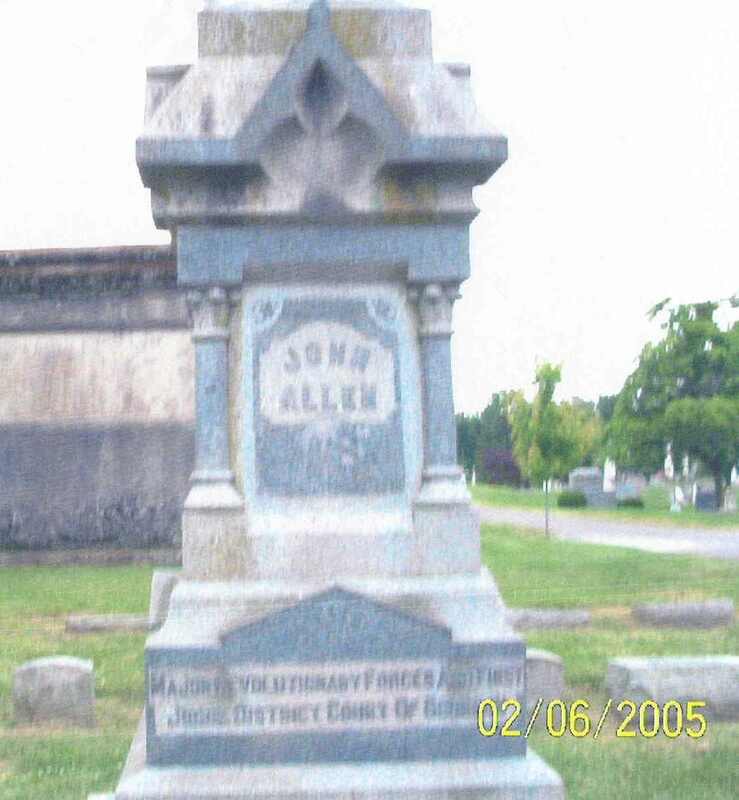 Grave of his wife next to his has marker. John Miller born Sept. 21, 1752 came to Kentucky in 1775 and located on the land on which Millersburg is situated. Soon he returned to Cumberland County, Pa. and married Arm McClintock and returned with her the following year. He died Sept. 5, 1815 the remains of both lie under his monument. Transcription on the John Miller monument in the old cemetery at Millersburg, Bourbon County. He build Miller’s Fort. William McConnell born 1753 died 1813 is buried in Hutchison Precinct on farm owned by Ned Brent Heirs and located on Earls and Lexington Pike. A government marker has been placed at his grave. Descendants had the War Marker attached to it. 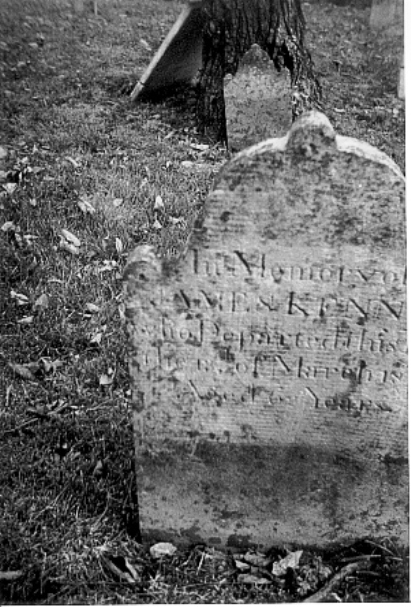 Joseph Penn buried in his family, burying ground in Hutchison Precinct on Bethlehem Pike. Grave marked by a monument that records he was born 1750 and died Aug. 29,1823. This graveyard is enclosed by fence and the gate is kept locked. Key in custody of descendent. Leut. Joseph Pugh is buried in the Ruddles Mills Precinct on the Cynthiana Pike in the family graveyard of his son-in-law, Samuel Ewalt near Mt Carmel Church. A white marble slab set in limestone covers the grave and bears me following inscription Joseph Pugh born June 28, 1753 Died Nov. 9, 1820. John Shaw born 1754, died June 17, 1827 as recorded on a white marble tomb stone. His grave is on farm owned by James Whaley just off the Paris and Maysville Pike, in Millersburg. A descendent has placed DAR bronze marker on his grave. Daniel Shawhan was buried in the Stoner Mouth Presbyterian Church yard at Ruddles Mills. Headstone recorded "born December 1738, died May 1791. Weathers Smith buried in the Ruddles Mills Precinct on farm belonging to William A. Grimes on the Peacock Pike. A large slab covers the entire grave and bears the following inscription "Born 1740 died Dec. 17, 1813. 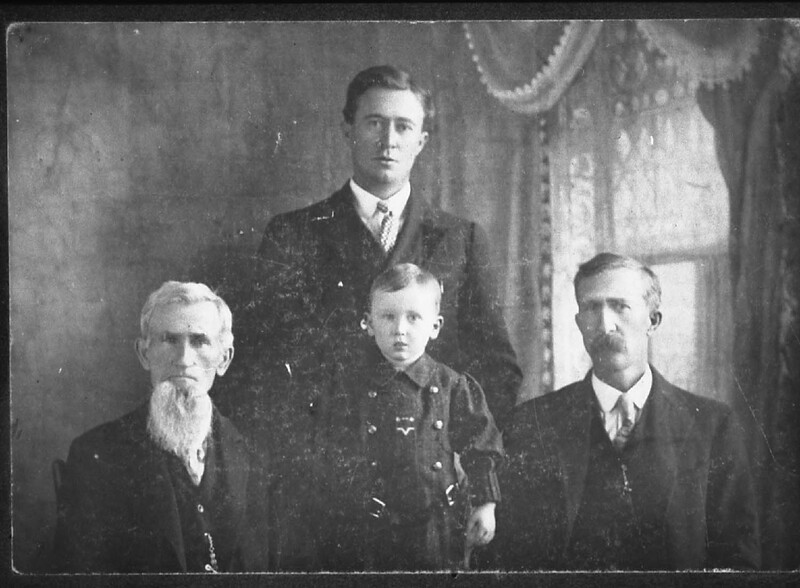 Samuel Stark was buried in the Hutchinson Precinct on a farm owned by Mrs. Wm. Meteer near Hutchinson station. Tombstone recorded inscription born Feb. 7, 1757, died 1819. Lewis Stark of the famous Missouri nurseries a descent of James Stark, and a Colonel in the e World War, has placed on James Stark's tombstone a bronze Revolutionary War Marker. William Thomas died 1820. Buried on E. K. Thomas Sr. farm owned by Mrs. Edward Simms. In North Middletown Precinct on the Spears Mill Pike. No marker was on the grave. Henry Thompson born 1740, died 1825 and was buried in the Old Cemetery at Millersburg. There is a white headstone that gave the above dates. Hubbard Williams buried in his family burying ground on the Josh Barton farm in Millersburg precinct near Millersburg, Bourbon C0. Inscription on his tombstone "Hubbard Williams born Dec. 2, 1762, died July 10, 1833". 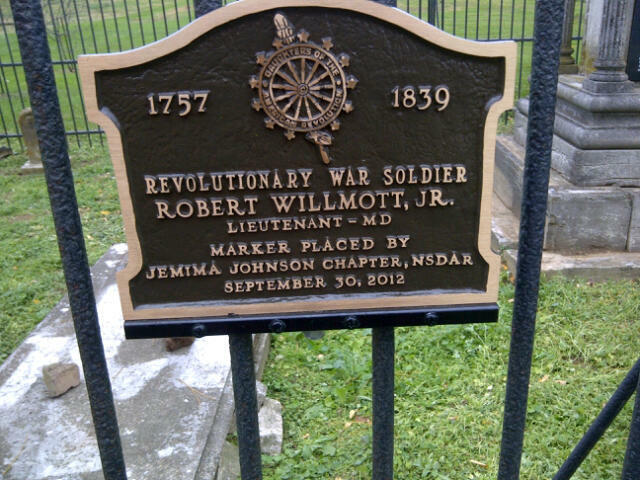 Robert Wilmott is buried in the Hutchinson Precinct, at his home place now owned and occupied by a descendant, Ike Wilmott. The grave is located in the yard of the home and is marked by a monument erected by his son J. T. Wilmott. 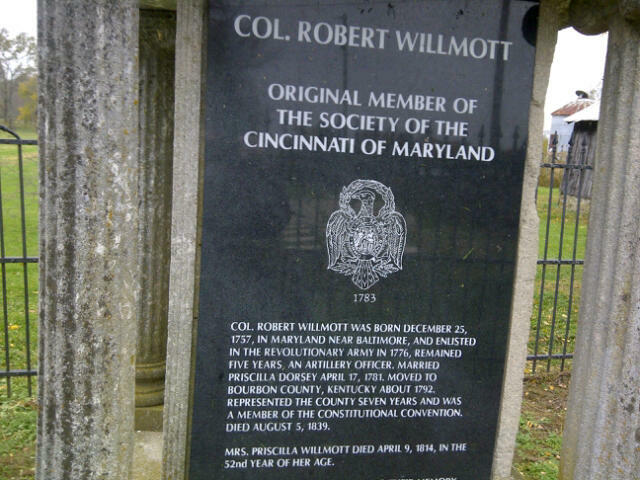 Inscription "Col. Robert Wilmott was born Dec. 25, 1757 in Maryland near Baltimore and joined the Revolutionary Army in 1776 and remained five years. Married Pricilla Dorsey on April 17, 1781. They moved to Bourbon County in 1792. He represented this county seven years as a member of the convention. Died Aug. 5, 1859. Mrs. Priscilla Wilmott died April 9, 1811 in the 52nd year of her age". Below are photos from the grave marking held by the DAR on 28 Oct. 2012. Anne Willmontt prepared and read from a brief biography on Robert Wilmott, Jr., which she has graciously shared here. Henry Wilson is buried in Little Rock Precinct at his home place on Little Rock Pike. There is no marker at his grave but it’s identity is certain because Wm. Rogers, an early pioneer in his diary still in existence stated the exact location of the graves of Henry Wilson and his wife, Frankie Faulkner. Henry Wilson built a Fort and dug an underground passage to a spring. The farm is now owned by John Brennan. John Brest born 1759 died Jan. 1, 1844 buried in the yard of Brest Tavern, which stands on the Paris and Cane Ridge Pike. Alexander Breckenridge born 1743 in Augusta Co., Va. Died 1813 in Bourbon County is buried on the farm owned by Charlton Clay on the Winchester Pike, about one-mile from Paris. William Caldwell born 1754 died 1829 is buried on Wilcox Estate near Houston Creek just outside the town Paris. Wm. Caldwell lost an in the Revolution. Robert Clark born about 1745 in Augusta Co., Va., died Jan. 1801 in Bourbon County is buried on a farm owned by John Woodford on the Winchester Pike one mile from Paris in Clintonville Percent. Samuel Clay born Mat 10, 1761, died April 9, 1810 and was buried on farm owned by Charlton Clay on the Winchester Pike, in the North Middletown Precinct. Daniel Delaney born Dec. 14, 1761, died 1849 was buried on lot in Paris Ky., where the Ice Factory now stands. This lot was formerly a graveyard. Thomas Rogers is buried in the yard of his home place in the North Middletown Precinct. The farm now owned by Mrs. James Dodge. Jacob Spears Born June 2,1754 In Rockingham Co., Va. died Sept. 25, 1825 in Bourbon Co. He was buried on the farm, on the Clay and Kiser Pike, owned by Carey Clay in the Centerville Precinct. Capt. James Wright born 1754 and died June 2, 1825 was buried on part of the original land grant made him services in French and Indian War. The farm in the Clintonville Precinct is now owned by John Woodford. Mitchell, Elijah - Huntington County, Indiana See Notes. Note: The principal creek in Bourbon County is named for George Michael Stoner. Thomas Conn buried on farm now the home of Robert Ferguson, on Georgetown Pike. 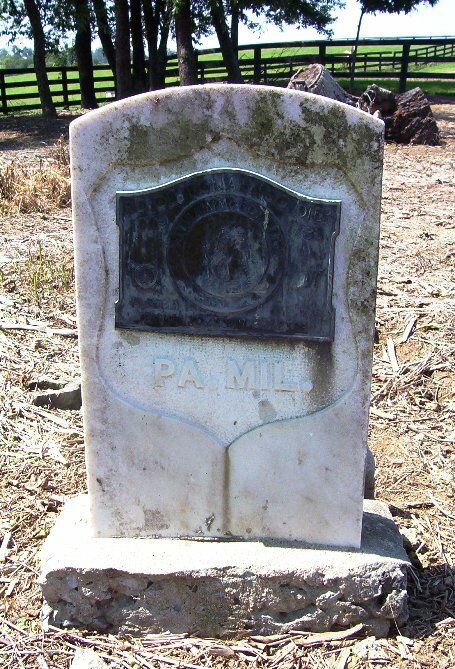 Robert Hill buried on farm now owned by Al. Current on Grmes just off the Brentsville Pike. David Jameson - on Lucy Buckner Kenney's farm on Cane Ridge Pike. Benjamin Schooler, buried at Jones Cross Roads (where the Clintonville Pike and Ironworks Pike cross) on farm owned by Mrs. Mattie Weathers. William Watkins buried on farm owned by Mrs. Robert Hopkins on the Little Rock and Cane Ridge Pike.